The best door, the best value. Eliminating the need for options or upgrades. 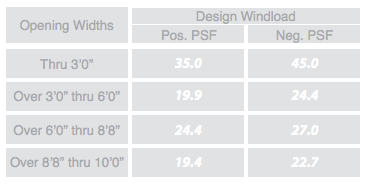 Our Model 750 Certified Wind Load Rated Door is designed and manufactured with durability, quick installation and ease of maintenance in mind. Standard features eliminate the need for options or upgrades. The best door, the best value. 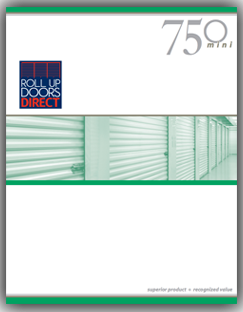 Roll Up Doors Direct International Corporation has achieved wind load certification with the Series 750 Roll-Up Door. The Series 750 Door was designed to meet stringent wind load requirements for mini warehouse applications while still providing the best door operation in the industry. The new innovative door design has minimized the locking and reinforcement needed to strengthen the door to pass rigorous wind load testing. If your business or home is located in an area that is prone to high winds, our model 750 provides reliable protection against high wind damage and offer fine craftsmanship, durability and style. We are committed to helping sustain our planet. The steel we use to manufacture our doors has 60% recycled content. The aluminum we use for extrusions has nearly 30% recycled content and the glass used in our doors has over 25% recycled content. The 26 gauge corrugated door curtain is manufactured from full hard galvanized grade 80 steel and coated with Super Durable Polyester paint that is backed by a 40 year film integrity and a 25 year no-fade limited paint warranty. Independently tested in accordance with ASTM-E330, the Model 750 meets the requirements of Standard Building Code, International Building Code and Florida Building Code. Available in sizes through 10’0” x 12’0” and in over 20 different standard colors. During production, each spring is coated with a generous amount of grease that penetrates the pores of the spring with additives, displacing moisture and preventing the formation of rust and corrosion. In addition, this process relieves the friction created between spring coils thereby providing smoother door operation. Finally, the spring and axle assembly is enclosed in a tube to protect them from the elements encountered throughout the life of the door. Doors stacked on top of each other in transit are going to shift… unless they can be packaged in a way to minimize the sliding that occurs during that time. Roll Up Doors Direct has found the way. As an option, we can suspend each door individually in crates. Whether they travel down the block or across the country, compaction damages, door abrasion and chatter marks are virtually eliminated. The ratchet tensioning device supplied as standard equipment on our door offers a simpler method of tensioning while more accurately fine tuning all the springs on the door at the same time. There is no extra hardware required. Eight different positions on the tension wheel allow one to perfectly balance the door every time. There are no pins required to hold the tension on the spring. You simply just click it. 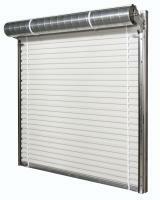 Roll Up Doors Direct supplies radial ball bearings at no additional cost. Our permanently lubricated bearings require no maintenance and are guaranteed to last the entire life span of the door. This design, noted for its durability and smoother operation with commercial applications, has now been incorporated into the Roll Up Doors Direct self storage door. The tube housing protects the springs and strengthens the axle. Eliminating axle push and shift that can occur with a live axle, the dead axle design allows for a straighter travel path of the door curtain in the guides. The biggest feature of this design is that it affords the fine tuning of any spring adjustment to equally affect all springs on the door at the same time. 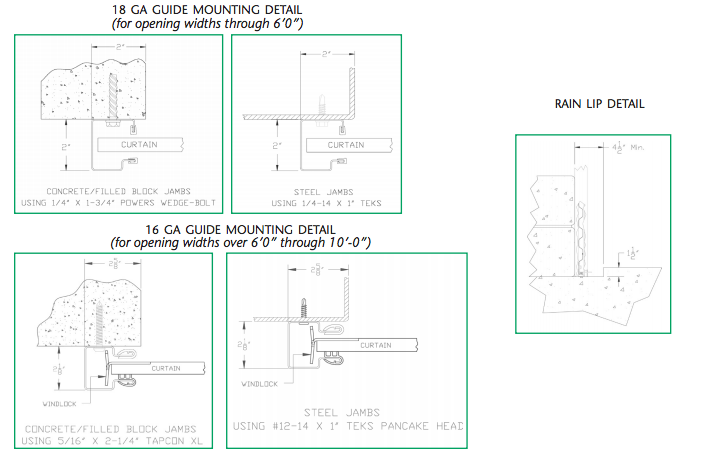 Universal mount 2” deep 16 gauge galvanized steel guides require no pre-installation modifications for wood, steel, concrete or masonry block applications. Guides have deeper engagement, which allows the curtain to stay in place under more severe wind conditions.